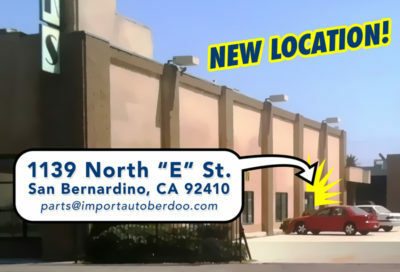 We are the Inland Empire’s first and oldest source for foreign car parts. In addition to most commonly needed foreign car repair parts, we have a large stock of unusual and hard-to-find import car parts. Since 1960, our goal has been to provide parts, information, and assistance to drivers of most imported cars. We stock parts for: Audi, Austin-Healey, BMW, Fiat, Jaguar, Mercedes, MG, Porsche, Triumph, Saab, Sunbeam/Hillman, Volvo, Volkswagen, other uncommon European cars, and some pre-1990 Japanese cars. Linden Malki, our parts manager, has been collecting foreign parts catalogs since 1963. Need something we don’t carry? If you shop on Amazon, searching for your purchases through this link will help support us, at no extra cost to you!